Moist muffins with fresh strawberries and mini chocolate chips. 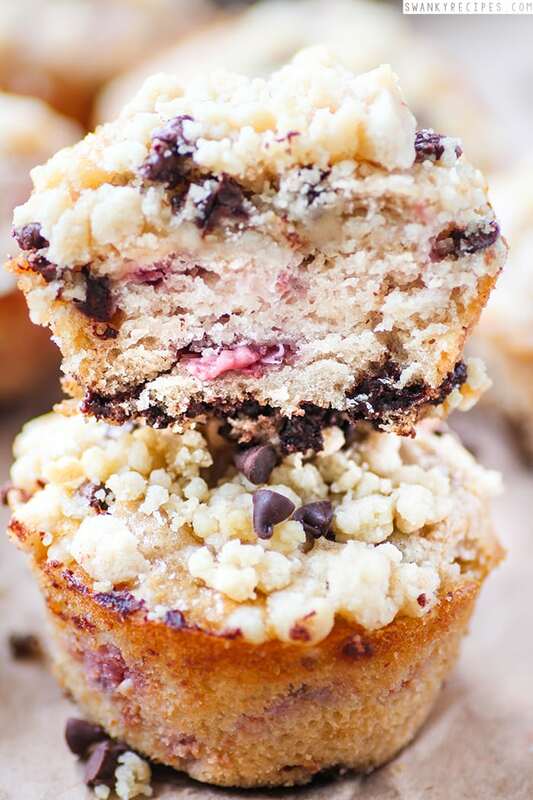 Topped with a shortbread and mini chocolate chip streusel topping. This recipe is lightened up by using applesauce and milk instead of butter and oil. Chocolate chip muffins are a classic dessert that just about everyone loves. These muffins take little time to prepare and can be enjoyed for breakfast or dessert. 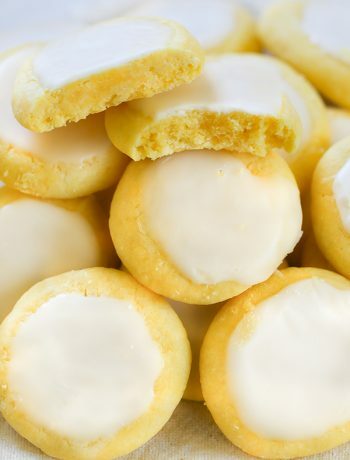 If you’re looking for a recipe to satisfy your sweet tooth, this recipe is for you. We’ve replaced traditional butter and oil in the recipe for applesauce and milk. This recipe is packed full of fresh strawberries in every bite. The strawberries in this recipe add the perfect amount of texture and sweetness. If you enjoy a lot of strawberries this time of year, they are great to add to recipes. I usually pick up a few pounds at a farmers market every 10 days during the summer. I like to add them to both savory and sweet dishes as well as to salads. To make this recipe start by preheating the oven to 350 degrees F and greasing a muffin tin pan with non stick cooking spray. Dice strawberries until you have about 1 cup. Whisking together flour, sugar, baking soda, baking powder and salt. In a separate bowl, mix together milk, applesauce, egg and vanilla extract. Pour liquid into dry ingredients and mix just to incorporate. Stir in mini chocolate chips and strawberries then pour into muffin tin and pour about 4/5 to the top. Next, make this streusel topping. In a medium bowl, combine flour, both sugars and cold butter. Using a pastry blender, fork or your hands, cut cold butter into dry ingredients until it is mixed very well and starts to crumble. You may need to add a little bit of flour at a time until it the mixture crumbles. You’ll want to add streusel topping before baking and after baking. I reserved about half the mixture for after baking and used half the mixture on top of the muffins before they went in the oven. Bake for 17 to 22 minutes. Insert a toothpick in the center and when it comes out clean, they are done. Press the remaining topping into the muffins. Preheat oven to 350 degrees F and spray 12 muffin cups with nonstick cooking spray. Wash and dice strawberries. In a large bowl fit with a mixer, combine flour, sugar, baking powder, baking soda and salt and whisk together. In a separate bowl, combine applesauce, milk, egg and vanilla extract and whisk well to combine. Pour liquid mixture slowly into flour mixture and beat on medium-low just until combined. Batter may be very liquid, this is normal. Stir in diced strawberries and chocolate chips. Pour batter 4/5 up to the top of muffin tin, making sure to scoop chocolate chips from the bottom. Meanwhile make the streusel topping. Combine flour, both sugars and cold butter in a medium bowl. Using a pastry blender, fork or your hands, cut in butter until mixture resembles coarse crumbs. Add more flour if needed to reach coarse crumbs. Toss in mini chocolate chips. Reserve half the streusel batter for when muffins are done baking. 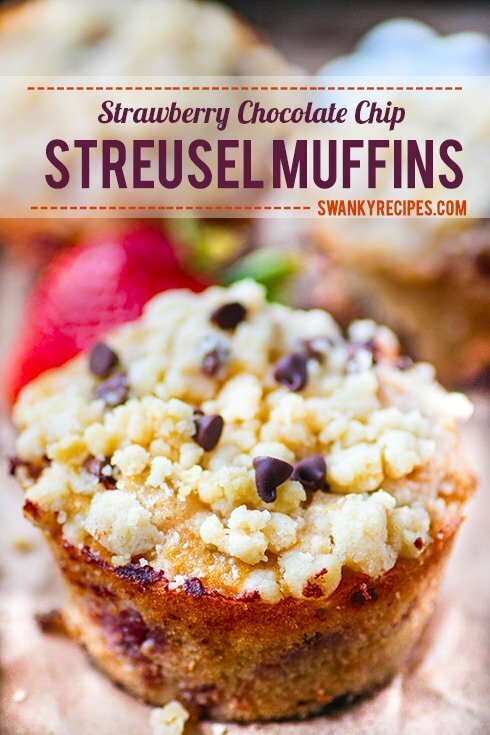 Sprinkle half the streusel batter on top of muffin batter. Bake in oven for 17-22 minutes. Remove from oven when an inserted knife in the center of the muffin comes out clean. Sprinkle remaining streusel topping into muffins pressing topping in. Jessica, your photos are awesome and that makes me think that the recipe is too, because the texture and moist yumminess (is that a word) jumps out at us. 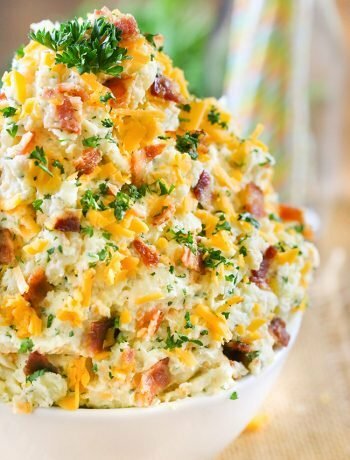 Thanks for bringing this delicious temptation to #HomeMattersParty . My mouth is totally drooling. 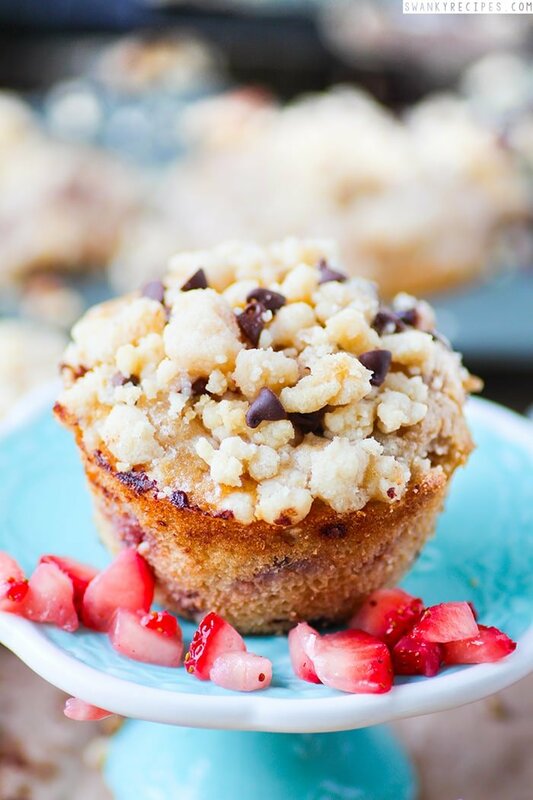 This recipe has so many of my favorite things – streusel topping, strawberries and chocolate! Can’t wait to try this recipe. Pinned. This would be delicious Muffins. Thanks so much for sharing your awesome recipe with Full Plate Thursday and come back real soon. What yummy looking muffins! Coming from Lou Lou Girls Fabulous Party! 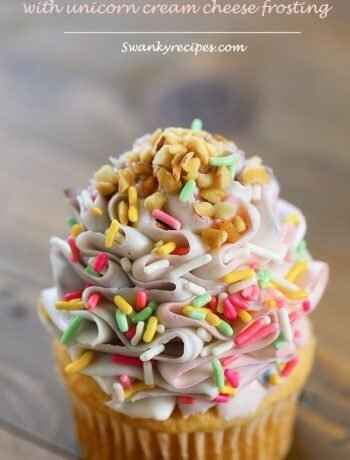 I made this recipe and they were unbelievably delicious! However, the chocolate chips I stirred into the batter all sank to the bottom of each individual muffin and stuck to the bottom of the cup. Any suggestions on how to avoid this and have them be dispersed evenly? Hi Melanie, put the chips in a separate bowl with some flour and coat them evenly. This should make them float!